Remember, the most important thing of all is to keep the surface clean!. Your shoes not only need to be of the right type but also need to be spotlessly clean when you stand on the surface. If the surface gets contaminated then weeds & grass will start to grow through & the surface will deteriorate & need replacing sooner. Anyone who does not have the correct footwear or footwear that is dirty will not be allowed onto the pitch; so be warned! 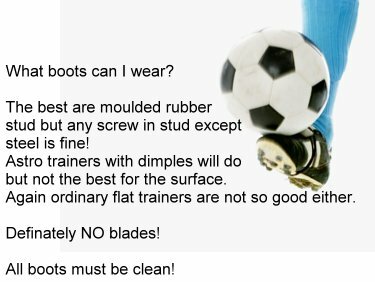 In other words it is best if you turn up with your clean boots in a bag ready to change into by the side of the pitch in the spectator area; don't be tempted to kick about on the grass pitches beforehand and then expect to be allowed onto the new plastic pitch in the same shoes! Also remember that chewing gum and bottles of pop etc will not be allowed either - leave them off the pitch with your change of shoes. It's the best facility around so let's look after it; respect it and report anyone who tries to do any damage. To book the AGP go to the 'AGP Bookings' link at the top of the front page where you will be redirected to the Whaley Bridge Council web pages. The full pitch measures 40mx30m with goals inset so that the full area can be used together with the rebound boards/fencing for 5 a side. The pitch is also split to accommodate two 5 a side games separated by a central splitter curtain.